The Shirakami Mountains is a huge mountainous area?130,000 hectare? on the prefectural border between Aomori and Akita Prefectures, with summits lying between 1000?1200 meters. 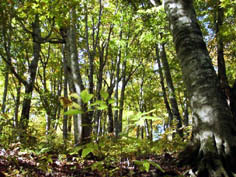 The core of the mountain area, about 17,000 hectare, comprising the last remaining stand of virgin Siebold’ s beech forests, is inscribed on the World Heritage List. The 17th World Heritage Committee, held in Columbia in December 1993, registered the Shirakami Mountains as a World Natural Heritage. The Shirakami Mountains Preservation Society was established in the same year with a hope of helping preserve the natural beauty of the Shirakami forests. Please note that there has been some struggles between developers and conservationists in this area before it was designated as a World Heritage. There was fierce opposition to the construction of a forest road. Local residents living along the Akashi River collected a petition of 1,024 people within the space of only a month, asking the Governor of Aomori Prefecture to stop the construction of the road. Consequently the construction aborted, but not without some damage to the virgin beech forest. Those residents who opposed the forest road still remember the flood of 1945 when their entire village was wiped away by torrential water. They knew what the construction of a road in the mist of a forest would do: Some years back, when another forest road was constructed further upstream, their mountains was dilapidated, rivers dried up, and animals and plants adversely affected. We need to confront this man-made destruction, if we want to preserve our natural beauty and global environment. Preservation of the Shirakami Mountains must begin with preservation of their forests. In fact, we have witnessed a sudden decline of black woodpeckers when huge beech forests were cut down in some areas of the Tohoku region. It is now reported the population of these black woodpeckers in the northern Tohoku region has dropped to 50. 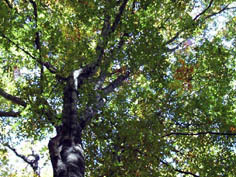 The Shirakami Mountains Preservation Society founded “ The Fund for Saving Black Woodpeckers and Restoring Beech Forests” in 2000. With the cooperation of the Aomori Prefectural Office, Ajigasawa Town Office, Tsugaru Forest Management Station, and local fishermen’ s unions, we initiated a beech forest restoration campaign: picking up beech seed in the forests, produce and plant seedlings in the Shirakami Mountains. In June 2002, our society was the sponsor of “ Shirakami Mountains Beech Tree Planting Festival in Akashi,” held near the core area of the registered World Heritage site. The purpose of this tree-planting festival was to provide green tourism for Shirakmi visitors and help them experience the natural beauty of the Shirakami Mountains along the Akashi River. We were happy to receive very positive responses from the participants of the program. We want many people to realize that as you walk in the midst of a beech forest, you are engulfed with a refreshing fragrance of beech trees, which you can breathe in through your skin, nose and mouth. It is total refreshment! You feel like you and the natural forest become one! You have discovered your ancient Jomon roots through basking in the forests! We would like to keep this preservation movement at least for another ten years and help restore this natural beauty of Shirakami Mountains.